« Are Army Recruits Poor and Dumb? I had meant to post pictures of my pumpkin, and just forgot. 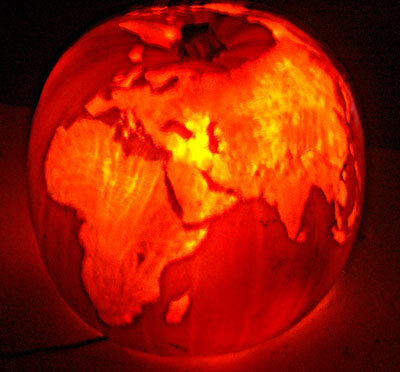 Here are a couple of my world pumpkin, which I carved by thinning out the pumpkin where the landmasses are, but not carving all the way through, such that the skin over the land was more translucent. (click on pictures for larger view). I didn't have a tripod handy so my long-exposure night photography is kind of shaky. I'm so glad to see you posting again, coyote. Wait . . . I see many recent posts. You must have moved your site. I'll have to catch up! 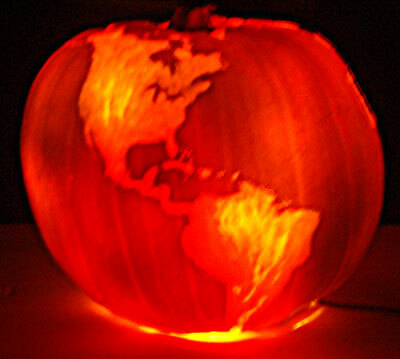 Excellent use of the medium.. of pumpkin! Of course, it's a globalized globe, one happy and aglow through free trade and entrepreneurship, and not some warm and fuzzy hippy-drippy "one world" organically-grown statist globe. That's beautiful, Coyote. I've only ever carved a few crude pumpkins, so I'm baffled as to how you did that. Would you mind explaining what techniques and tools you used? How long did it take?